From its outward appearance the contemporary colonial house 19 Pembroke Road resembles a modern day farmhouse, its solar panels on the roof seemingly a deliberate design element. DARIEN — Earth Day is months away. The annual event that calls attention to environmental issues won’t be celebrated again until next April 22, which will be the 49th such event. “Today, the fight for a clean environment continues with increasing urgency, as the ravages of climate change become more manifest every day,” says the earthday.org website. Get a head start on the cause with the purchase of the white contemporary colonial house at 19 Pembroke Road. The owners of this one-of-a-kind house can celebrate Earth Day and can do their part every day to protect the environment and create a sustainable future for generations to come. 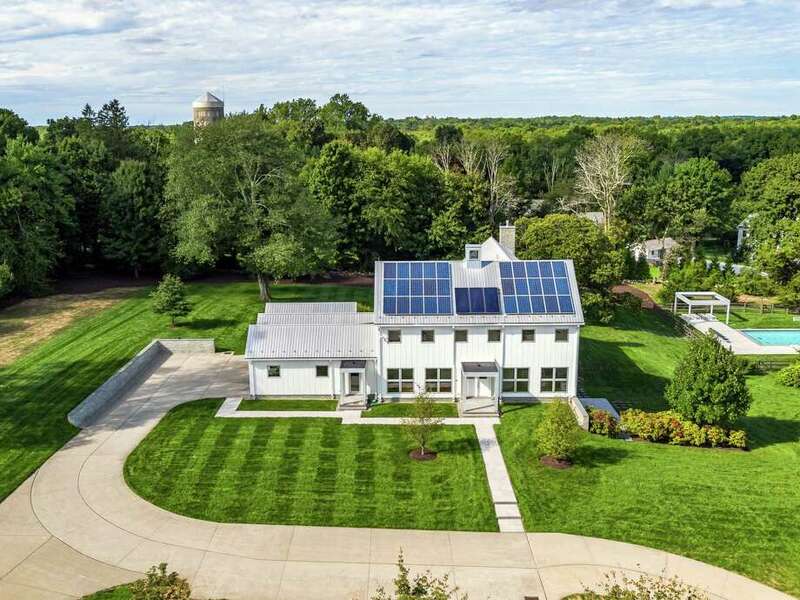 From its outward appearance, this house resembles a modern-day farmhouse, its solar panels on the roof seemingly a deliberate design element rather than being an afterthought that can sometimes be an eyesore. These panels look like they belong there. On the interior, the house has a laundry list of sustainable features that make this, arguably, the coolest house in Darien; and that’s not just marketing jargon, it just might be true on two fronts. First, it has geothermal heating and air conditioning, which keeps it sufficiently warm in winter and cool in summer while keeping energy bills low. According to the listing agent this house was designed and built “to be healthier, more comfortable, require less maintenance, and use less energy, significantly lowering heating and electric costs while incorporating architectural innovation.” To keep the house cool, it uses cross ventilation and an air exchanger than pumps fresh air into the house. Second, an online dictionary defines the word cool as “fashionably attractive or impressive,” and this house definitely fits that description. In fact, at a recent public open house event, many people used the word “cool” to describe this house. Several said “cool” as they walked through the front door. Others used the word as they wandered around and made note of all its features. “What a cool house,” someone uttered as they walked through its 15 rooms within its 6,142 square feet of living space on three floors. “This is so cool,” said another. The house was constructed with green or sustainable building materials in 2010, although it looks like new construction. Its amenities are too numerous to mention, but hitting the highlights this house has renewable energy sources such as radiant heat and photovoltaic solar panels. It also has LED lighting, low-flow water saving features, low/no VOC (volatile organic compounds or non-toxic) paints, a programmable thermostat, rainwater harvesting or collection system, a sprinkler system with a rain sensor, tank-less hot water, and Energy Star-rated household appliances. The three finished levels are anchored by a dramatic, custom steel and solid maple staircase. Modern spaces flow from one room to the other, while taking full advantage of the floor-to-ceiling windows that look out upon the 3.38-acre largely level property — which includes a Gunite in-ground swimming pool, cabana, two Chinese granite patios, open lawn and meadows of wildflowers to provide nectar for pollinators. The views of the attractive grounds are no marred by utility poles and wires. In this area there are underground utilities. Split rail fencing lines the front of the property. Ample parking exists on the front and sides of the house in the concrete, rather than asphalt, driveway. Chinese granite paths lead to the covered front entrance, which features French doors. The foyer features an enormous coat closet with cabinetry and storage shelving. Unlike most house floor plans it is not the living room that is encountered first. In this unique layout the cavernous eat-in chef’s kitchen is to the right of the foyer and the spacious family room is to the left. A wide gallery cuts through the center of the house and leads to the very large space that comprises the living and dining rooms. This combination room has the home’s only fireplace, a stacked stone fireplace mirroring the stacked stone wall outside. Many of the rooms feature sliding and other doors to the patios and property. At the back of the house, there is a sizable office with a wall of built-in cubbies and a sunroom of equal size. Everything seems large in this house including the mudroom, which features push-button cubbies with ventilated storage of shoes and sneakers underneath. The powder room was not overlooked when the architect doled out innovative features. It has a flooring of little stones, a modern boxy sink, contemporary lighting, and a blue mosaic tile tray ceiling. In the kitchen, there are custom teak cabinetry, red lacquer accent cabinets for the two center islands, Corian counters, and Miele appliances including an induction cooktop. On the second floor there are four bedrooms and three full baths. All the bedrooms have blackout shades. The master suite faces east to take advantage of sunrises. The fifth bedroom is on the walk-out lower level as is a temperature-controlled wine room and a playroom. For information or to make an appointment to see the house, contact Deirdre McGovern of William Raveis Real Estate at 203-554-0897 or Deirdre.McGovern@raveis.com.